How booming trade, bilateral ties and strong diplomatic ties have made Nigeria Israel's strongest African ally. What does the future hold? On a bright and sunny day in June, New York witnessed two solidarity rallies – one for the three Israeli teens kidnapped in Judea and Samaria, the other against terrorist group Boko Haram after it abducted 319 girls from a school in Chibok in northern Nigeria back in April. The two communities came together to pray for the safe return of both the Nigerian girls and Jewish boys to their families. Sadly it was not to be, the Israeli teens were brutally murdered by Palestinian terrorists and the Nigerian schoolgirls are still being held by the radical Islamist group. A month before the rallies, Israeli Prime Minister Binyamin Netanyahu had sent military and intelligence hardware to Nigeria to help the army in its search for the missing schoolgirls. After the abduction of the Israeli youths, Nigerian President Goodluck Jonathan sent a letter to Netanyahu condemning the act and demanding their immediate release. Nigeria and Israel have not always enjoyed such a healthy relationship. In the aftermath of the 1973 Yom Kippur War, relations came to an abrupt end when Nigeria’s military government cut ties with Israel to comply with a resolution passed by the Organisation of African Unity, the precursor to the African Union set up in 1963. This marked an end to what had been a productive engagement by Israel in Nigeria’s development. Until then Nigerian farmers, educators, students, academics, doctors, community workers and engineers had received training in the Jewish state, and in turn Israel sent experts to help with the development and modernisation of the Sub-Saharan state. Relations between the two countries were not formally rekindled until 1992, and the following year Nigeria set up an embassy in Israel for the first time and Israel in Abuja. Nigeria is the most heavily populated country in Africa and has the largest economy on the continent with an annual growth rate of 7.4 per cent. 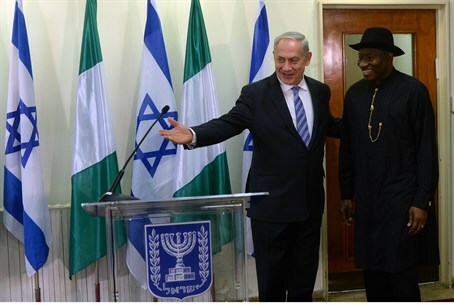 It is hardly surprising that Israel increasingly sees Nigeria as a viable economic and strategic partner. In 2006 the Ministries of Foreign Affairs of both countries signed a Memorandum of Understanding, which formalised the bilateral consultations on political issues between the two countries. Today the two countries enjoy fruitful relations, with free flowing trade, commerce and collaboration in a number of areas. The relationship has further blossomed since President Goodluck Jonathan took office in 2010 and today Nigeria is in the top 20 destinations for Israeli exports. Between 2012 and 2013, Nigeria’s exports to Israel rose from $165m to $276m. There has also been reciprocal visits by high-level government officials and exchanges of technical and professional knowledge through MASHAV, the Israeli Centre for International Cooperation. The expectation is that the Bi-lateral Air Services Agreement, signed by the two countries last October, will make it easier for Israelis to invest in Nigeria, with travel time significantly reduced between the two countries as a result of direct flights. It is also hoped that the agreement will make it easier for Nigerians to travel to Israel, and Israelis the other way. A flight to Israel from Nigeria can cost up to $2,800 but Nigerian tourists still flock to Israel in impressive numbers. According to the Israeli Embassy in Nigeria, 31,570 Nigerians visited Israel in 2010, 50,620 in 2011 and 30,000 in 2012. Today, over 50 Israeli companies actively operate in Nigeria, both directly and through joint ventures, in areas such as agriculture, construction, communications, hi-tech, infrastructure, water management, education and health. In 2013, President Jonathan became the first Nigerian president to visit Israel, where he visited religious sites in Jerusalem and Nazareth as a Christian pilgrim. At a historical meeting, both President Jonathan and Israel's then-President Shimon Peres paid homage to the relationship between the two nations. According to Urial Palti, Israel’s current Ambassador to Nigeria, the trip was crucial to cementing relations between the two countries, allowing the president to strike a personal relationship with the Israeli PM. The ambassador said the relationship was so strong that Netanyahu believes he can now rely on Nigerian support at the United Nations. The Nigerian president also used his visit as an opportunity to strengthen economic relations between the two nations, and made requests for further Israeli investment in Nigerian healthcare, agriculture, electric power and supply and water management. Since 2010, Israel has committed to partnerships with Nigeria in healthcare and agricultural development. In January, Israel’s Agriculture Minister Yair Shamir and his Nigerian counterpart Dr Akinwumi Adesina signed a declaration for greater agricultural cooperation between the two nations. There are a number of Israeli corporations operating in the country, such as Motorola Israel, and the Nigerian-Israel Chamber of Commerce, based at the Israeli Embassy in Lagos, says that Nigerian businesses are also investing in Israel, with 5,000 Nigerian businesses and organisations scattered across the country. Nigerian-Israeli relations are at an all-time high and set to flourish further, but with the 2015 General Election in Nigeria approaching, what would happen if President Jonathan’s People’s Democratic Party failed to get re-elected. Would a new President continue the goodwill? Would a Muslim President, from the north of Nigeria, continue the strong religious ties to Israel? With so much at stake, there are nervous onlookers in both Abuja and Jerusalem. The rally in New York showed the vulnerability of two people caught in the labyrinth of extremism with an enemy that threatens not only their values but their very existence. Israel may have not got their boys back alive but still hopes and prays that Nigeria recovers the girls safely. While it is inevitable that the threat of extremism is unlikely to fade fast it is even more pertinent for this new found solidarity and economic cooperation to flourish.